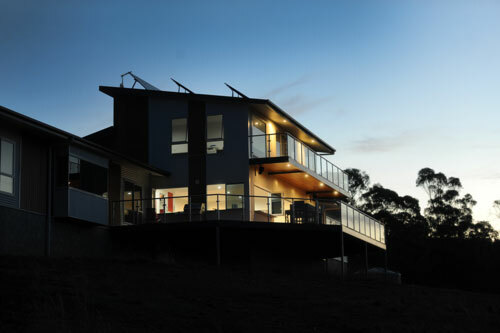 This residence is located on a large parcel of bush, 2km from the main road. 10 years ago the owner built a small shack while he saved to build his family home, and he purchased a standalone system that was installed on and in a shipping container. Two years ago, MODE Electrical began consulting during early stages of the new build project to provide input to the overall house design and functionality. Together with our client we compiled daily load calculations, to determine how many kWh were required each day, and looked at ways to reduce the overall daily power consumption to come up with a workable scope. The outcome of this load profile, together with the age and restrictions of the old system used for the shack, meant a complete new power system would be the best option for the new home. 4. A modern low maintenance home, well heated and cooled, whilst compensating for off grid constraints as if they did not exist. A sub board had been installed in the shed for the old system, which was fed from this main switchboard. The best location for the new system was in the shed. There was plenty of space to house the batteries at one end in a vented battery box and the generator at the other end exhausted outside. The most effective location for the solar modules however was on the house because the shed had considerable shading issues. Sub mains from the house to the shed had already been installed; so running DC cabling between was going to be difficult and also a very long distance. Based on these restrictions, the size of the system required, and that most of the daily load was on the house we chose to use an AC coupled design to complete the system. 5.3kW of solar PV was installed on the main roof to provide the main power input. The outcome of the daily load calculation showed the potential for large intermittent loads to come on together, and therefore an inverter with high output power was required. We chose to use a SMA Sunny Island 8.0H inverter/ charger. A gas powered 10kVA automatic start generator was installed to provide backup when required. Gas was chosen so it could share a fuel source with the gas cooking appliances and run from the same gas cylinder. 18kwh on average was required to run the home but due to the size of the house and some variables this value had the potential to blow out very easy. A 1300Ah 48v Exide energy store battery bank was chosen and installed in a vented battery box. The Exide batteries were preferred because they came with plastic acid containment tubs to confine potential acid spills. We installed a 2pole changeover switch to provide an alternative power source if the sunny island or battery bank failed. The switch will disconnect the sunny island and supply the generator direct to the loads, thus providing a failsafe system. A SMA 5000TL inverter was installed upstairs in the house below the solar array to provide the AC coupled part of the system. The inverter was connected direct to the Sub board in the house, providing direct power to the household loads during the day as well as back feeding into the Inverter charger (Sunny Island) to charge the batteries as required. The existing 20x 190W panels from the shack were installed tilted up to 35 deg on the main roof facing north. A row of 6x 250W REC panels were installed behind these tilted to 40 deg. A remote control for the sunny island was installed inside the home to control the entire system as well as monitor the battery state of charge. The remote control can also manually start the generator if required without the need to go out into the shed. The generator is set to automatically start when the SOC gets down to 70% and turn back off once it reaches 80%. It has been programmed to only run between 3pm and 10pm. This makes sure the solar PV has the best chance of charging the batteries before the generator is required. Close to 1 year on and our client is exceptionally happy with his system and has not had a power outage. The power system services 4 bathrooms, 3 televisions, large fridge, dishwasher, hydronic and hot water pumps, computers, full house audio system, lighting, power and large workshop. We are currently installing a wind turbine as stage 2 of the project to provide extra input during the short cloudy winter days. Clever design meant that a very powerful, yet affordable system could be integrated into a new home, and still provides the modern living comforts the client hoped for.